So, you want to learn how to cook and you want to explore something new and exciting on your trip to Egg Harbor. Why not try one of the excellent cooking classes in Door County? Become a master of everything from quiches to homemade yogurt. Take a culinary tour of the French Riviera, Sicily, and coastal Mexico as you sample and learn to cook some of the most unique flavors in the world right here in Wisconsin! Whether you want something savory or sweet, there is a cooking class for you. Looking for other great activities in Door County? Request access to our free Vacation Guide for the best local tips and recommendations in the area! Sample and make regional and international cuisine the Savory Spoon Cooking School! The two and a half to three-hour classes give you hands-on experience in the kitchen for all interests and experience levels. Morning and afternoon classes are available every week with a majority of them taught by Chef Janice Thomas. After you cook your delicious meal, sit down and enjoy your creations at one of their tables, elegantly set with candles, fresh flowers, and French linens. Located just 30 minutes from The Ashbrooke, this is the perfect place to celebrate your family reunion, host a bridal shower, or savor a special date night! Check out their class calendar for a complete list of upcoming culinary adventures. Discover the sweet side of Wisconsin at these Door County cooking classes. Desserts rule at The Flour Pot, where you make and bake your own pie or buy one of their homemade Belgian pies and sweets. Learn the secrets to making the perfect pumpkin cheesecake, apple bars, and much more! They even feature a unique candy making clinic! In addition to dessert classes, The Flour Pot has a floral shop and farmers market where local goods, in-house desserts, and flowers are available to bring home for a special treat! This is a great Door County activity for all experience levels! After a day of flexing your cooking muscles in the kitchen, rest your culinary mind in one of our luxurious and well-appointed accommodations. The Ashbrooke has everything you need for your perfect romantic getaway to Door County this fall. Our premium amenities feature an indoor pool, outdoor sundeck, fitness room, and much more! You’re never very far from some of the best dining and attractions in the area. 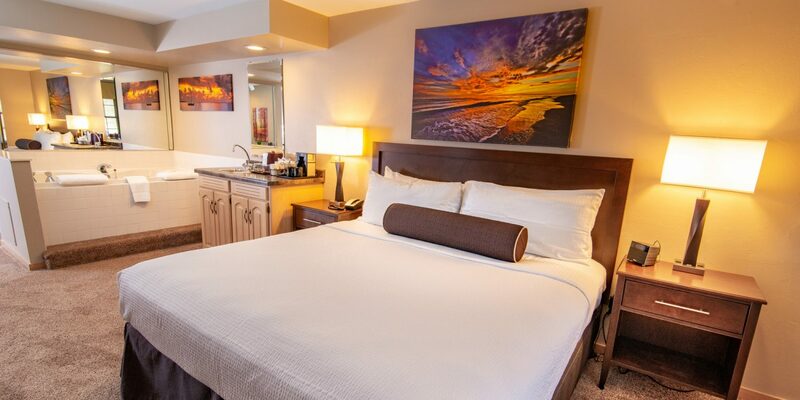 Our Getaway Room is the perfect hideout for a weekend escape! This romantic retreat features an in-room two-person whirlpool tub. Relax in your plush king-size bed and surf the internet with our free WiFi as you prepare for another adventure-filled day in Door County. Extend your stay to three or more nights and receive a special rate! Check our availability and don’t forget to request your free Door County Vacation Guide to start planning your romantic fall getaway today! We can’t wait to meet you!